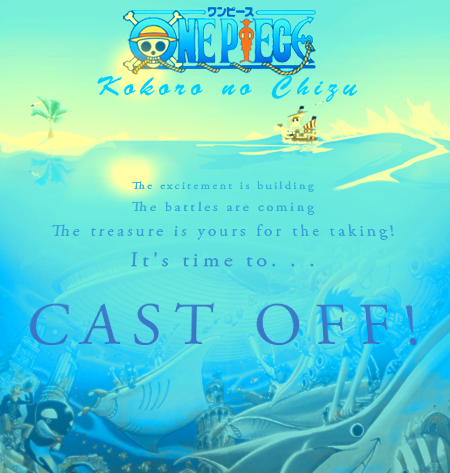 [blockquote][blockquote]One Piece: Kokoro no Chizu is a brand-new One Piece Roleplaying Site seeking new and friendly faces for a bit of adventure. Set into a non-canon replica of the One Piece universe, where the world would have continued as if the canon characters of One Piece did not exist, the site features a heavy emphasis on character development and interaction, looking to take those who want to reach the top to that spot. With playable races such as Giants, Cyborgs, Merfolk, Fishmen, Skypeians and Humans, you have your choices to make; your own destiny to create. As a Vagabond, the lawless cutthroats of the sea who seek only fortune; a Pirate, the free-spirited searchers of fame, merriment, camaraderie, and money; or a Marine, the controlling mastermind army of the World Government; you'll carve your own path into fame, fortune, and everything in between, to make friends, slaughter enemies, and set sail upon the High Seas.